Accolades are abundant for David Soren, Regents’ Professor of Anthropology and Classics at the University of Arizona. He was named 2018 Undergraduate Teacher of the Year by the Archaeological Institute of America. He was granted honorary Italian and Greek citizenship – and officials in the Umbrian region of Italy recently named an olive strain after him. That’s right, the Soren Olive. The Director of the UA Study Abroad program, Arizona in Orvieto, is no stranger to the spotlight. He first rose to fame as a vaudeville performer in Philadelphia at the age of eight, starring in a popular variety show on CBS. His penchant for entertainment would carry over into his young adult years as well, with stints as a singer in rock and roll and folk bands. So how did a former showman from the streets of Philly become a world-renowned archeologist? According to him, it started with a love for movies and solidified with study abroad. Consumed by the 1950s vaudeville world as a young child, Soren’s free time was especially precious. To this day, he has vivid memories of visiting the movies when he could escape from work. “Movies about archaeologists were very popular at the time; they came to life. You had your khakis and your pith helmet. You went to exotic places where you discovered these incredible ruins and ancient civilizations. So when I got to college I wanted to see these places,” he explained. Soren attended Dartmouth College where he originally majored in English, hoping to become a screenwriter for the kinds of movies he adored as a child. He quickly changed his academic trajectory, however, after visiting Italy on the Stanford Overseas study abroad program, as it was known at the time. Particularly amazed by trips to the ruins, Soren visited the American Academy in Rome eager to learn more, but encountered some disappointing news. When Soren returned to the United States, he put the wheels in motion, switching his major from English to Classics. Soren held true to his plan to become a professor, completing a Ph.D. in Classical Archaeology from Harvard University. In the years that followed, he earned a legendary reputation for archaeological excavations. He directed digs throughout Tunisia, worked in Cyprus on the puzzle of a great Mediterranean earthquake, identified malaria as a contributor to the downfall of the Roman Empire, and helped uncover an ancient spa in the Tuscan region of Italy. During excavations in Italy, Soren and his wife Noelle, also an archaeologist, became friends with a man and woman from Orvieto named Claudio Bizzarri and Alba Frascarelli. To this day, Bizzarri is the Professor in Residence of the program, and Frascarelli the Program Coordinator. Soren and his wife spend time each year in Orvieto, demonstrating their enduring commitment to the program. 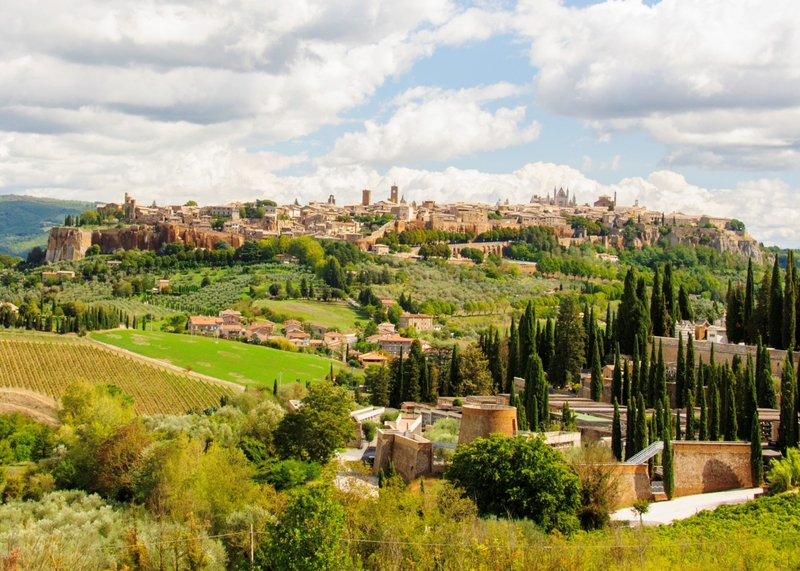 Now the UA’s largest UA Study Abroad program, Arizona in Orvieto is offered in the spring, summer, and fall semesters – each year allowing dozens of UA students life-changing experiences through study abroad. So what is their secret to study abroad success? Soren emphasizes three things: the people, the space, and the locals. For faculty members who want to start a program, Soren not only emphasized the people of the international community, but also the students of the UA. Soren stressed taking a transparent tone with students who might be interested in study abroad, and asking them to help spread the word. He employed this approach when he first started Arizona in Orvieto. As part of this collaborative project, Soren also relies upon the expertise of UA Study Abroad, located within the Office of Global Initiatives. Looking back to the first time Soren set foot in Italy, he wanted to provide study abroad opportunities for students, regardless of their financial means. Looking back at his storied career, Soren cannot help but see irony in his journey from child star to celebrated archeologist. “I’d always had an interest in breaking out of this confined space of entertainment where you go someplace and sing and dance, and then go on to the next one. You were in a box,” he explained. Arizona in Orvieto is one of the UA’s most popular study abroad programs, located in the beautiful town of Orvieto, just one hour from Rome. Students may enrich their studies in a variety of courses, including: Classics, Italian, Art, Art History, Communication, Psychology, Journalism, English, Music, and Architecture. For more information about Arizona in Orvieto, please visit studyabroad.arizona.edu.